It was supposed to be 80% chance of rain and 20 mph winds... but honestly, I didn't care. Word was that "Stucky's", a pond down here in Jeffersonville, Georgia had lunker bass spawning everywhere. 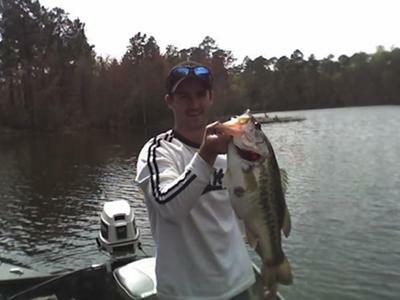 A good friend had caught three already over 10 lbs, two over 12,... so rain, sleet, or hail, I was going. It took me 45 minutes to get there from Warner Robins, Georgia (where I'm from) and when I got there, I backed my boat up in a hurry and hopped on in ready to scope out the bass. But guess what... there was a problem. I forgot my polarized glasses at the house. The nearest Walmart... 45 min away!! Well, an hour and a half later and with a new pair of polarized glasses, I was once again ready to scope em out. I didn't troll more than 60 feet when I came across this whale of a bass sitting dead in the center of a nest. I knew instantly she was over 10. I backed off about 20 feet and cast a 4 inch chartreuse pepper lizard in the nest. I tried for about 30 min to catch her but no luck. So I took a rebarb pole (about 7 feet tall) and stuck it in the water beside her bed to mark it so I would know where it was at and decided to look around a bit. Well, after a few 3-4 lb bass were put in the livewell, I came back to the big girl, this time stopping about 25 feet from the rebarb pole and made a few casts. On the last cast, the lure landed a few feet to the left of the nest, but I figured, "what the heck, I will give it a try." I twitched the lure about three times and Wham! FIGHT ON! She pulled about 30 feet of line down the bank, tried to get wrapped around my troller motor, and almost got tangled in my anchor. But, luck was on my side this day. I netted the hog... 11 lbs 2 ounces. Biggest bass yet. And yes, she is on my wall now...lol. And the funny thing was, it didn't rain a drop all day and the water was calm as glass!!!! Wow! 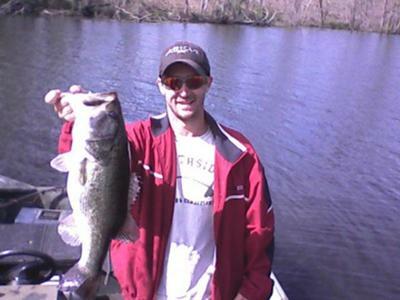 Those are some big old largemouth bass. That is so flippin' sick! Lucky you. 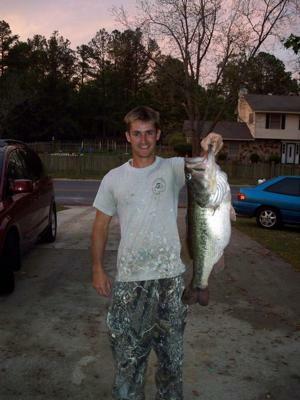 Georgia has some of the biggest bass around. 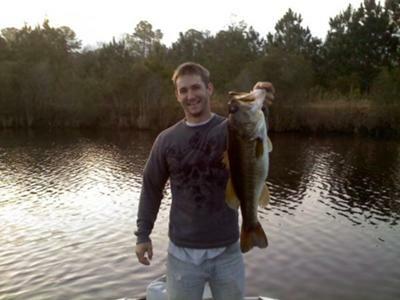 I mean, Georgia is where George Perry caught his world record bass at, right?